Disclosure: I have some personal history - I wouldn't say we were "friends", but we were more than casual acquaintances - with one of this film's executive producers. That is to say: we were in film school together, and I production designed a short he directed. I do not think this colors my opinion, for we haven't spoken in some eight years, but take it as you will. They were right. It's a superhero movie that does something truly groundbreaking and breathtakingly original, and I couldn't be happier: Joss Whedon and Seamus McGarvey shot a summer tentpole in the 1.85:1 aspect ratio and did a really fine job showcasing action within it, instead of defaulting to the anamorphic 2.35:1 ratio that shows up everywhere despite only a tiny handful of directors and cinematographers knowing how to actually use a frame that damn wide. But surely that is a stupid thing to lead with. I'll be honest: I truly can't think of a legitimate reason to review The Avengers (and as for analysing it, that just sounds like a fool's errand). Given the unfathomable sum of money it's already taken down, it's impossible to suppose that any interested parties might still actually be on the fence, and even if they were, here was what I found: it was exactly the movie I expected it was going to be, which is to say: a great amount of fun, t'riffic visual effects, dialogue that was quippy and enjoyable more often than not, every inch of 30 minutes too long, and if I were ranking it in the context of the other Avengers pictures, it would go securely behind Iron Man and Captain America: The First Avenger, closer to Iron Man 2 but still ahead of it, a damn sight better than The Incredible Hulk and Thor. All of which is precisely what I anticipated, and I think it's fair to say based on conversations that I've had, that for every individual viewer, it was pretty much precisely what they were anticipating, too, from the people hellbent on despising it to the people who honestly and truly seem to think that we're currently in an End of History moment, cinematically. I will confess to a significant bias, which is that I think I'd have dug The Avengers a lot more if it really honest-to-God was a culmination of some sort, and not just another step along the route to another half-dozen Marvel films leading into, ultimately, The Avengers 2. As it is, this film strikes me as more of a semicolon than an exclamation point, not so much the triumphant binding-together of many disparate elements as it is DisParaUni Presents Marvel's The Avengers Initiative: Part 6. It is not the apotheosis of franchise pictures any more than Harry Potter and the Deathly Hallows: Part 2 was, merely a franchise picture with an exceptionally smart marketing hook. For that matter, I enjoyed it considerably more than Deathly Hallows 2, so there. There's something that feels hugely product-ey about it: writer-director Whedon is, I think, incontestably the most personable and unique of the five filmmakers who have thus far helmed films in this series, and he does something to give The Avengers spark and sizzle and a personality all its own, but this still has the unmistakable flavor of corporate-approved filmmaking by committee, feeling an awful lot like the films that came before it, which is partially a good thing, because it thus maintains tonal, thematic, and visual continuity with its prequels. Yet for all its hugely expensive spectacle, there's nothing that truly does deserve the praise "like nothing we've ever seen before". In fact, it's like a lot of things we've seen before: louder, and with bigger sets, and with grander destruction, but in a lot of ways the best thing I can possibly say for the film as a popcorn epic is, "Transformers: Dark of the Moon for literate people who enjoy wit", and I can't help but feel like that is not what I was promised. Anyway, I did say that I saw no reason to review it, so now that I've vented my frustration at the ZOMG Best Movie hype, I'm instead going to meet on its own ground: mindless fun where the best "analysis" one can do is to enjoy it as a serious of impressions and sensations that one recalls more with amusement and fondness than any sort of emotional attachment. This, then, is my series of impressions. Most Improved Actor: Chris Evans as Steve "Captain America" Rogers. In his own movie, I complained that he was the only person who didn't have a handle on playing the '40s; but here, aided by a few really choice lines of dialogue, he absolutely nails the arguably much harder job of being a man from the '40s with very traditional ideas of moral behavior, thrust in the sardonic modern world, (all the more sardonic because Whedon is writing it). I have never, in fact, been more excited for Captain America 2 than after seeing The Avengers, for that exact reason. Yes, I know that I'm being played by the studio. Most Improved Character: Natasha "Black Widow" Romanoff, as though it wasn't obvious from the second Whedon signed on that he'd save the shallow eye candy character from Iron Man 2 and make her one of his customary Action Girls; but he did, and it is great. Except that Scarlett Johansson turns out to be much less effective at playing a Whedon Girl than playing eye candy. But that is not the character's fault. Most Un-Improved Actor: Robert Downey, Jr. is definitely not having as much fun playing Tony Stark as he did in the two Iron Man films, right? Hopefully he'll perk back up when he gets to be the center of attention again. Most Un-Improved Character: Tom Hiddleston does what he can, but the layered, complex, genuinely wounded and sad and thus all the more dangerous Loki of Thor has been reduced to a tittering psycho who interested me not at all. Also, the much-discussed "make the Germans kneel before a psychopathic dictator spouting nihilistic drivel" scene didn't really do it for me, but it was for an absolutely indefensible reason on my part: I see a comic book movie bad guy force people to kneel, I instantly start unfavorably comparing him to Terence Stamp. Most Exactly the Same: Chris Hemsworth has not changed his Thor in the slightest, bless him. A friend, who has not seen Thor, leaned over during the character's first clumsily-delivered speech of Heightened Prose, and asked me, "does he always talk like this? ", to which I replied, "there's a reason that Thor was my least favorite of the prequels". The Improvable Hulk: Holy goddamn, Mark Ruffalo is all this character has ever wanted to be and if they aren't already working on a new Hulk standalone, they are idiots beyond compare. Best-written and best-played character in the film without a doubt; I'd go so far as to call it the best comic book movie performance since Heath Ledger in The Dark Knight. Serenity is a mad delight of popcorn sci-fi, but Whedon isn't a born filmmaker. This we knew. And I feel that what he's doing here isn't directing, so much as it's air traffic control. That being said, he did great at the one thing that mattered most: keeping the balance of power in order: no hero dominates, and no hero feels like window dressing, not even Hawkeye (Jeremy Renner), despite only really showing up to the party two-thirds in. And that being said, I got the definite vibe that as much as he worked to get the screentime and impact on the plot right for the six heroes, Whedon certainly has his favorites. These are my guesses: like all of us, he's intoxicated with Downey's Tony Stark, and he's way excited to make ScarJo the next Buffy/River/Echo. He understands why Captain America is historically important but doesn't personally like the character. He is almost as bored with Thor as I am. Whether he loves the Hulk or not, he has finally solved the Hulk cinematically, and that is what matters. The script, of course, is bright and breezy and full of so many quotable quotes that I can't even start to list them. I remain perplexed as always why people claim Whedon to be a master of shifting emotional tones: as always with his work (outside of That One Death in Serenity), I found his attempts at introspection and depth to be far less convincing than his playfulness, but there isn't much room left over for inner psychology anyway; that's for the solo adventures, and also Chris Nolan. At one point, the characters wonder why this crisis is the one that forced Nick Fury to assemble the Avengers. And I must agree with them. Aliens over New York? Is that, like, meant to impress us? Because from where I'm standing, there are lots of ways to film the epic, universe-spanning Kree-Skrull war besides making the 400th aliens-over-New-York movie of the last two decades. The Transformers comparison wasn't idle. As if the casting of Samuel L. Jackson wasn't proof already that these films are taking their marching orders from the Ultimate universe, the aliens are called the "Chitauri", despite "Skrull" being a name of greater history and more charmingly hokey in its Stan Lee-ish "they're bad because they have a bad name" way. The money is onscreen, as they say. There are a few patches of bad CGI, as is the case with nearly every other Marvel film (I was particularly unimpressed by the exteriors of the flying aircraft carrier), but you'd have to be either a real grouch or an inveterate hater of the form to deny that this is by and large some really damn fine explosion-mongering, and given that I'm both of those things and still liked it tells you something. The 3-D represents a new high for post-production conversion, and the film is bright and full of potent bursts of color when it needs to be, impressively austere when it doesn't. The action is marvelously well-assembled, with some of the best editing I've seen in a superhero movie in years - the final sequence in particular boasts some exquisite cross-cutting, and on the whole it lacks the over-worked ADHD feel of so many big studio movies of late. The final sequence, however, is also too long, and perhaps I am just getting old, but there is a definite point when elegance and efficiency should trump quantity, and the massive battle of Manhattan that closes out the film manages to get to that point, pass it, and get to it again, before overshooting it a second time and finally ending. The barbs and quips tossed by the characters entertained me a great deal more than their bullets, lightning bolts, and arrows. Alan Silvestri also needs to stop writing movie scores, because they all sound really damn impersonal. 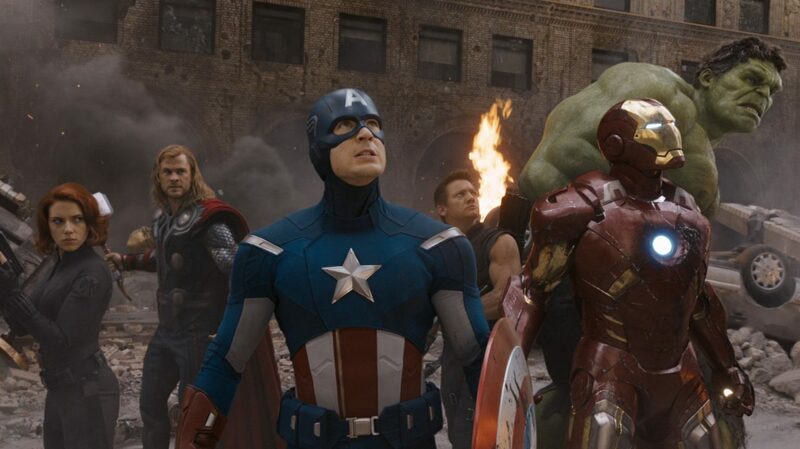 I am very much a fan, perhaps idiotically so, of the big long computer-aided tracking shot that is the only truly showy directorial choice in the film, in which each of the six Avengers is shown being an action hero in turn, as the camera flies all over and around the city. Big, broad commercial filmmaking at its finest.